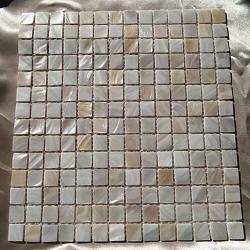 A SQUARE FOOT SHEET CONTAINING 3/4" (20MM) MOTHER OF PEARL TILES IN A NATURAL FINISH WHICH HAS A SLIGHT BEIGE OR PINK HUE. THE TILE THICKNESS IS 2MM. 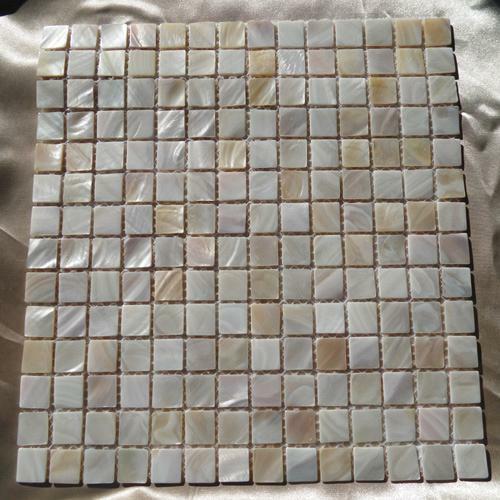 STUNNING PEARL NACRE ON THESE SHEETS AND PROVIDE SUCH AN ELEGANT BACKDROP FOR BACKSPLASHES, WALLS AND ALL YOUR MOSAIC PROJECTS. SHEET CONTAINS 196 TILES MOUNTED ON MESH AND READY TO INSTALL. ALSO AVAILABLE IN A 1/4 SHEET OF 25 TILES.